Zentangle or more commonly referred as "Zen-doodle" is a relaxing and meditative art form with absolutely no rules to follow, no prior Drawing expertise, complete freedom to pen your creativity on paper. It focuses on making intricate designs and motifs in a structured manner. Paintology therefore brings to you this meditative art form which helps one learn art with various designs and swatches and helps grow patience but this time, to add a little spark, we will be doing the art on a diary, which will be a useful outcome of the workshop! As intricate as it looks, it is an easy form of art where NO PRIOR EXPERIENCE IS NEEDED. Come learn this form of art with us and learn to fill up objects with these patterns. 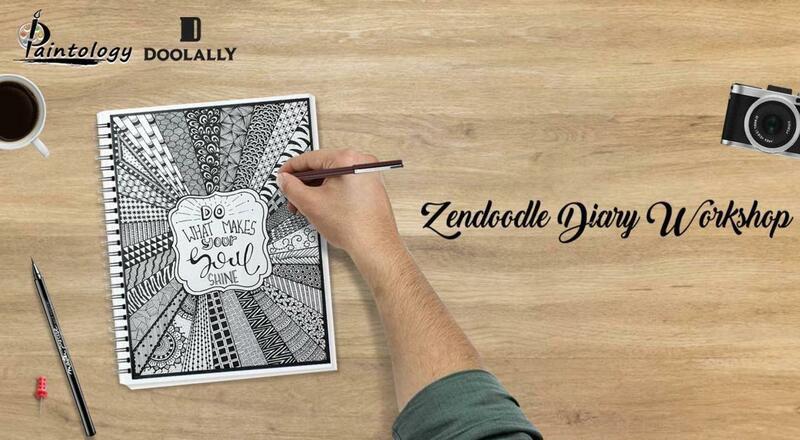 NO EXPERIENCE NEEDED, you will be guided step-by-step by our artist- Trushi Shah a perfect expertise at Zendoodles!Come-sip-doodle-munch and take a beautiful piece of art with you home. Paintology was formed in order to make every layman, explore the hidden artist within them. Vinisha Savla, founder of Paintology aims to spread colors and art with a positive vibe as she strongly feels that every color has its own psychological property and the power to control our moods and emotions, hence naming it as: Paint+Psychology = Paintology!